I know it's been awhile since I last posted on here, life has been busy lately. I recently moved to a new apartment and I also went on a week long vacation immediately after. So after finally unpacking my painting station and supplies I decided it was about time I started on some of my Golden Demon entries. I am going to enter some of my previous stuff that I have done but wanted to paint up a few things specifically for the competition. 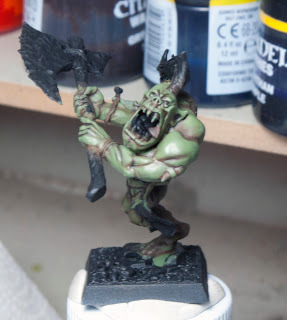 First up on my table is the new Savage Orc Warboss. 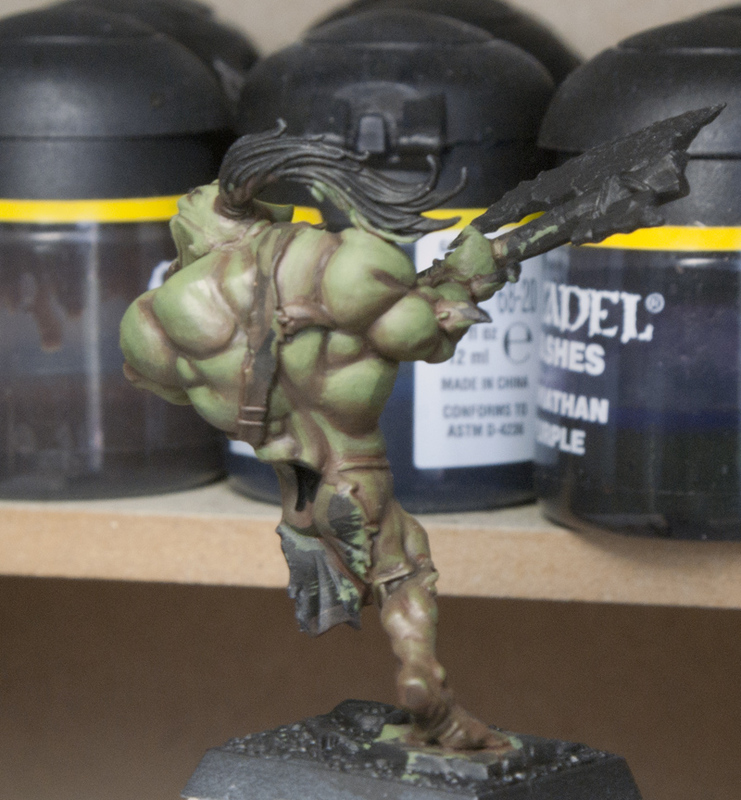 This guy is very WIP, I only have the basecoat and shading done, and only on the upper torso. I am trying to make a subtle gradient from the base green to a dark brown/green before doing any of the highlights. 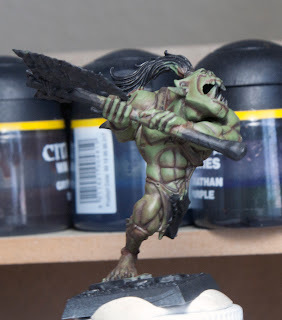 I am following a 'Eavy Metal guide for more natural looking Orc skin from a White Dwarf a few years ago. I plan on making his loincloth look like Lizardmen skin and giving him plenty of tattoos, not sure on designs or color yet. 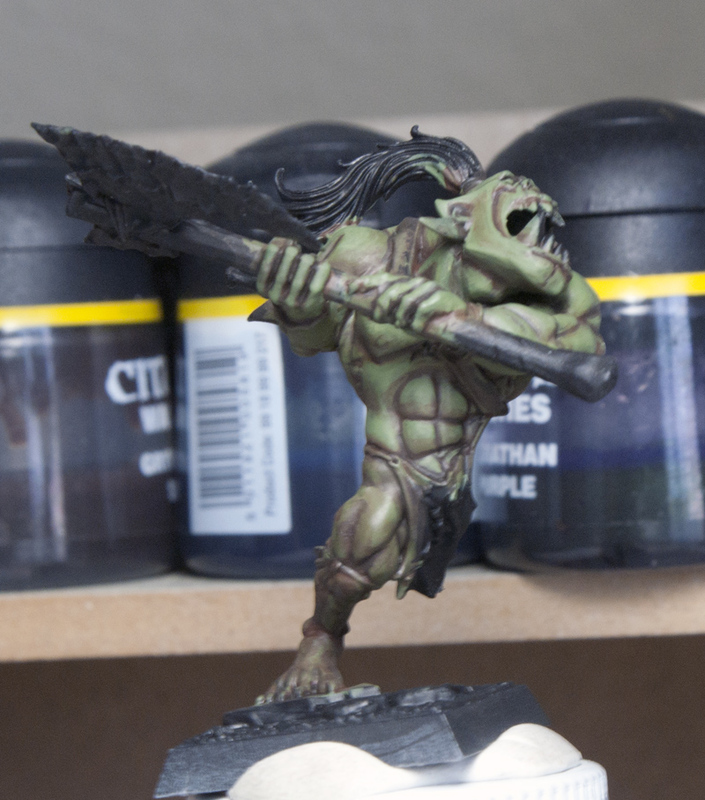 I am also thinking of giving him a war paint Orc skull glyph on his face. If I go that route I want to make it look worn and messy, like the Joker's from the interrogation scene in the Dark Knight. I will try and post more pictures of this guy as I paint him but don't be surprised if the next time you see him he is completely done.